I'm not going to lie, sometimes I am really, really bad at getting all my veggies in for the day and I also get in the habit of only sautéing or baking instead of eating them fresh. My life changed one day as I decided to prep my veggies. I bought collard greens with those big beautiful leaves to put in my smoothies and when I chopped off the bottom half, realized that the top half kind of looked like a big green tortilla. I know what you're thinking. "Stevie you didn't invent collard green wraps", and I'm going to disagree, just kidding! However we all get inspired at different times and its a matter of situation. Here are a couple recipes that I really fell in love with but to be honest I find that you can throw so many things in, even laying around your fridge, to make it so tasty! This prevents food waste, getting a healthy amount of protein & nutrients in, and fills your tummy! For eco friendliness, source your ingredients local, organic & from the farmers market! Bring a cloth produce bag when grocery shopping to prevent using the plastic bags they offer. I buy mine from Simple Ecology! For the sauce: Add all the ingredients to a very small bowl and whisk or mix altogether with a fork until its smooth and creamy! For the filling: Saute mushrooms with olive oil or coconut oil on medium low with light salt. Shiitake can be tricky sometimes because it can get rubbery if you don't cook it right - so the longer you cook it on a medium to lower setting, the better it gets. Be friendly with the oil you put in, it makes it so buttery and yummy!! After about 5-7 minutes, add spinach just for 2 minutes. 1. 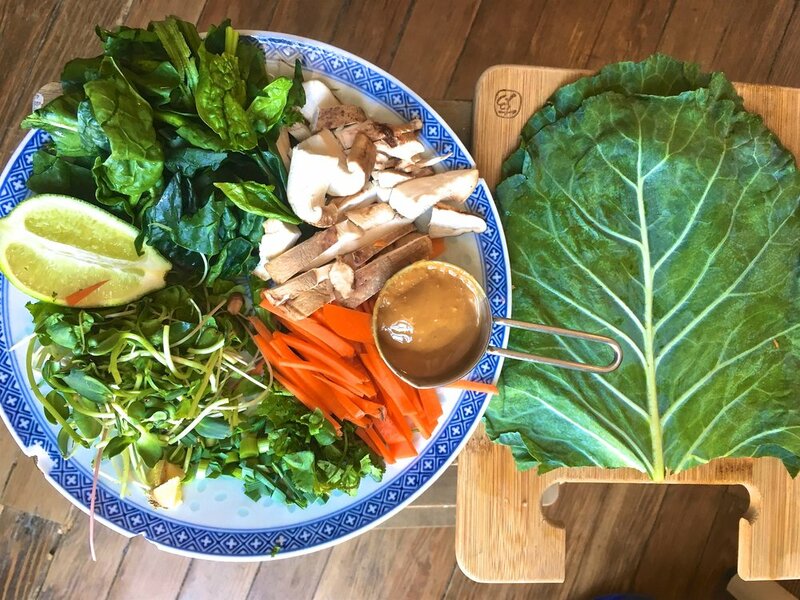 Spread the peanut sauce in the middle of your collard wrap. 2. Add the mushrooms and kale/spinach then add the rest! 3. Take the edge of your collard leaf over the middle part over the filling and start rolling!